Thanks to all who made this event so enjoyable. Further events coming shortly . . .
19 November 2018 - 14 January 2019 Latimer Room, Maritime Centre, Newbiggin-by-the-Sea, Northumberland. Solo exhibition of selected paintings 2006-2018. 15-29 November 2017 Dirty Lux, art installation created in collaboration with Durham University Botanic Garden for the foyer of the Durham Radisson Blu Hotel during the Durham Lumiere Festival 2017 featuring tree, coal, hard hats and coloured lights. 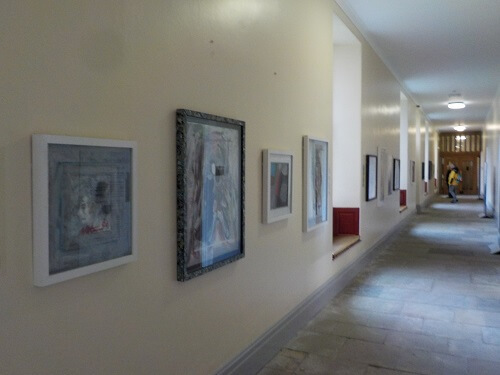 22 June - 29 November 2017 St. Joseph's Chapel, Ushaw, Durham (formerly Ushaw College, a listed historic building and former Catholic Seminary) the painting series Sentence (see below) exhibited with specially commissioned cello and spoken word soundtrack created by composer/cellist Mark Carroll. 7 March - 23 April 2017 Manchester Cathedral. Solo exhibition of Sentence: A Work-in-Progress, eight paintings based on a letter exchange with a British man serving a sixteen-year prison sentence in a notorious US jail. 23 January - 1 April 2017 Durham World Heritage Site Visitor Centre Courtyard. In other Words - a collaborative art and sound installation with recorded poetry and music celebrating the 30th Anniversary of Durham's UNESCO World Heritage status. 16 June - 31 August 2016 Durham Botanic Garden. Art installation The Bikini Line, commemorating the 70th Anniversary of the first atomic bomb test at Bikini Atoll, South Pacific and the naming of the iconic swimwear. 4 May - 16 June 2013: Egon Schiele (Courthouse) Museum, Neulengbach, Austria: 24 drawings created in Egon Schiele's former prison cell exhibited alongside original poems written by Alan O'Cain in English and German. Part of the Exhibition "Schiele Reloaded" mounted by the State Museum of Lower Austria. 18 June - 6 July 2012: Blake Gallery, The Woodville, Gravesend: Solo exhibition of 108 coloured pencil studies for a portrait of Sir Peter Blake supported by Gravesham Council and Derwent Pencils. 8 February - 8 March 2012: Duke's Theatre Gallery, Lancaster: Solo Exhibition to coincide with the British Shakespeare Association Conference: Selected works from Full Fathom Five, with further sketchbooks, projected images and paintings on display at the Rare Books Archive at Lancaster University. October 2009: Presentation and exhibition of the painting Remains commissioned by the Elmet Trust for the Mytholmroyd Ted Hughes Festival, a work celebrating the legacy of Ted Hughes in the Calder Valley, place of his birth. September 2007 - May 2008: fourteen paintings of Full Fathom Five exhibited throughout Hendon Hall, London, former home of the 18th Century Shakespearean actor David Garrick. May -August 2007: Glyndebourne Gallery: Selected paintings exhibited from on an official collaboration with Glyndebourne Festival Opera from a project working with productions of Verdi's Macbeth and Britten's The Turn of the Screw. July 2007: Capital Culture Gallery, Covent Garden, London: Selected portraits and other works, part of group show. Residenz, Salzburg: Selected portraits and other works, part of group show. 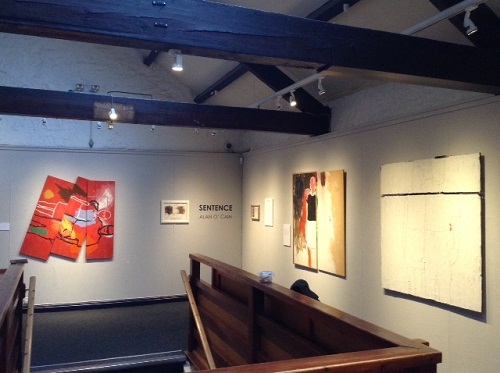 7 March - 24 March 2007: Capital Culture Gallery, Covent Garden, London: Solo exhibition: Full Fathom Five: paintings from an official collaboration with the RSC and wall-displayed original poetry by Alan O'Cain. May 2006: Hay Festival: Solo exhibition: Words of Art: paintings inspired by the words of famous writers displayed along with a poetry-reading corner for the selected poems of Alan O'Cain. There are thousands of people out here "trying to be artists". But one cannot "try" to be an artist. One simply is. And the only thing true artists are "trying" to do is avoid starvation.